There was no way this series would go a full year without a Mario game. But! Everyone knows the signature Mario themes, while Super Mario Bros 2 is a different story. “One Must Fall: 2097” was released in 1999 and remains my favourite fighting game ever. Piloting a 90 foot tall, hundred ton robot in a combat arena? What’s not to like? 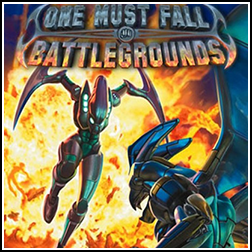 Four years later the sequel “One Must Fall: Battlegrounds” was a disappointing game featuring great music. Age of Wonders. Michiel van den Bos. ’nuff said. Today’s soundtrack is an odd one – I’ve never played the game, but have used the album extensively as the soundtrack to a completely different game. Introducing Josh Whelchel’s score for The Spirit Engine 2 – my unofficial soundtrack to Minecraft. Sometimes a puzzle game isn’t just difficult, it’s so neuron-wrenchingly frustrating that it needs a flawlessly written soothing score just to keep you from using your controller as a blunt instrument. Braid, obviously. What’s that you say? It’s been more than a couple of weeks since I posted anything by Big Giant Circles? For shame. Well then. here’s the latest game soundtrack he’s done – Pocket Mine. After Dawn of War last week, let’s tone things back down a bit and listen to something altogether more relaxing. Introducing Skyward Collapse, a game putting you in the mystical shoes of a Creator with the power to destroy men and gods.